SNHU alumni volunteers are a vital asset to our community, helping at events, mentoring students, speaking in classes, organizing service projects, and so much more. We're proud to recognize outstanding members of our community who make an impact every day, strengthening the SNHU experience and improving the world around us. If you know a volunteer who deserves to be celebrated, please email us with the nominee's name, class year, and a brief description of the ways he or she has contributed. Barbori Streibl '16G led the very first Canadian Global Days of Service project in 2018. She absolutely loves being involved as an alumna. 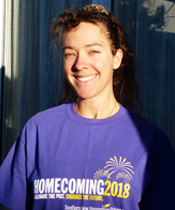 She has participated in everything from virtual Homecoming activities to joining the monthly discussions of the SNHUreads Book Club, and is even on the Alumni Board. Though Barbori isn't close to campus, she takes every opportunity to give back to SNHU from afar. What inspires you to volunteer at SNHU? The inspiration to volunteer with SNHU comes from the University’s forward-thinking! SNHU has found the right way to balance between celebrating its past (history, achievements and successes) while also knowing how to be innovative and encourage new ideas from its students, alumni, staff and faculty to be able to offer the best going forward. To me, this is what makes SNHU unique and why it stands out from other universities. SNHU is always looking for ways to improve learning experiences and offer more opportunities to connect with its students and alumni. SNHU looks to its community of students, alumni, staff and faculty on a continual basis for input on how and when to offer those things, and so the opportunities for being inspired to volunteer are many! What do you enjoy most about volunteering at SNHU? What I enjoy most about volunteering is that my ideas matter to SNHU. Through bringing my volunteer ideas to life, others benefit (students, alumni, etc. ), there is the opportunity of growing and strengthening the SNHU community on a global level. I also have the chance to expand my own skills and knowledge by learning and trying new things. What results have you seen from your efforts? I have seen and received appreciation and thanks for which I am very grateful! I have also shared my knowledge through webinars on the topic of working from home and thus grown in my confidence to deliver a fun and interactive webinar. Also, because of my efforts, I was able to help bring about the first Canada Virtual Meetup for alumni in March 2018. Did anything unexpected happen as a result of your volunteer activities? Doors open, new opportunities appear, and connections with others worldwide in the SNHU community – alumni, students, and staff – are continually made. Those are among the many unexpected and invaluable rewards I have encountered and enjoyed as a result of my volunteer activities. Will you continue to volunteer at SNHU? Why? Yes! Volunteering with SNHU is very fulfilling as my contributions to the SNHU community are truly appreciated. In turn, I value the time, thought, and effort which SNHU staff invests into focusing on identifying and meeting the needs of its students and alumni and being open to trying new things. Will you encourage others to get involved? How? Yes, I will definitely continue to encourage others to get involved! There are so many opportunities to choose from, such as, participating in or leading a Global Days of Service project; being on the Alumni Board of Directors; and sharing one’s skills, knowledge, and talent through a webinar or at the SNHU LEADS Conference. The possibilities of giving back with SNHU are infinite! I encourage anyone who is thinking about volunteering to reach out to the SNHU Alumni or Online Engagement teams. You just need to let them know what you would be interested in volunteering for/helping with and they will take it from there. Volunteering with SNHU is so rewarding and whatever time and energy you can share with the community is greatly appreciated!